Do your kids go crazy for any of the many variations of tiny plastic critters they all seem to collect these days? Mine sure do. Instead of bringing more plastic into the house, why not have your kids make their own? ​Here’s a little taste of one of the projects we do in Toymakers to really get the creative juices flowing! ​It’s fun, and fabulous for exercising those spatial skills. ​​Or, if your child wants to build with friends and you don’t want a table full of marker mess-ups, just bring them to Toymakers camp July 17-21. 1. Start with a simple shape like a cube, rectangle, or pyramid, flat and printed on light card stock. 2. Have the kids think about their animal, and decide if they want to make just a head, or the whole animal. 3. Tell them they will add any decorative details, like eyes, tails, spots, toes, etc, to the blocks when they are flat, then they can fold up the shapes and see if the detail (like the eyes) ended up in the correct place. If it doesn’t work, they can get new shapes and try again. 4. Tell them to guess where each side of the shape will end up once folded. ​TIP: It’s very important that they put these details on the paper BEFORE folding. It really exercises their Spatial Processing. 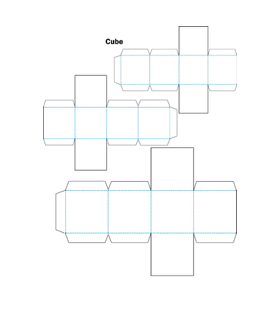 Cubes in 3 sizes, like Goldilocks, and this isn't even Fairy Take Engineering! ​5. Now the (most) fun part… Decorating! Kids should draw their details (eyes, ears, tail, legs, etc) on the side and at the orientation they think it will be correct once they fold it up. 6. The kids should then cut out the individual shapes on their printouts. 7. Have them fold and glue or tape their flat shapes into 3D shapes. 8. Once their blocks are completed, ask them if their animals turned out like they intended. Did the eyes go in the right place? Did the other details end up where they thought they would? How else can they add to their animals? ​If the animals did NOT turn out as expected, they can just recycle the paper and try again. Making mistakes and learning from them is a wonderful and crucial step in the tinkering process. There is so much brain growth in the process of figuring out WHERE and WHY something went off, and how you can do it differently to get the result you want.